A man who blew himself up and injured 12 people after being turned away from an open-air music festival was a 27-year-old Syrian who had been denied asylum, Bavaria's top security official said early Monday. "We don't know if this man planned on suicide or if he had the intention of killing others," Bavarian interior minister Joachim Herrmann said. He added that the man's request for asylum was rejected a year ago, but he was allowed to remain in Germany because of the strife in Syria. A spokesman for the prosecutor's office in Ansbach said the attacker's motive wasn't clear. "If there is an Islamist link or not is purely speculation at this point," said the spokesman, Michael Schrotberger. The explosion came as Germany, and the southern state of Bavaria in particular, have been on edge. Just two days earlier, a man went on a deadly rampage at a Munich mall, killing nine people and leaving dozens wounded. And an ax attack on a train near Wuerzburg last Monday wounded five. A 17-year-old Afghan asylum-seeker was shot and killed by police as he fled the scene. 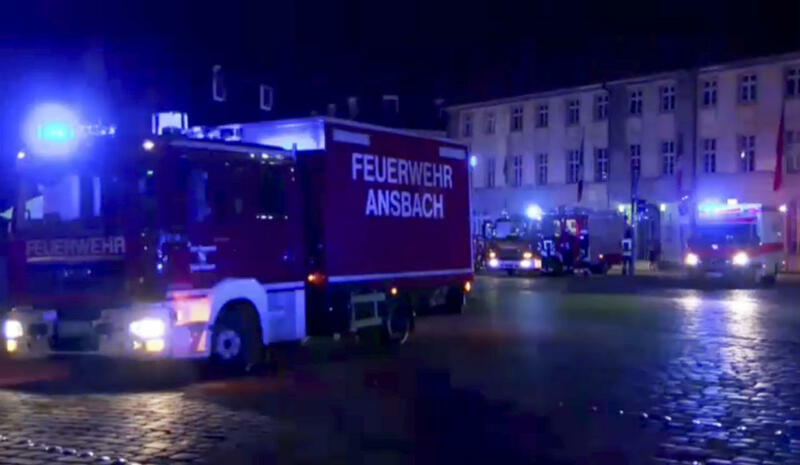 On Sunday, authorities said they were alerted to an explosion in Ansbach's city's center shortly after 10 p.m.
Bavarian public broadcaster Bayerische Rundfunk reported that 200 police officers and 350 rescue personnel were brought in following the explosion in Ansbach. The recent attacks in Bavaria, a picturesque, mountainous haven for travelers, came shortly after a Tunisian man driving a truck killed 84 people when he plowed through a festive crowd celebrating Bastille Day in Nice, along the famed French Riviera. After the Munich attack, Herrmann urged the German government to allow the country's military to be deployed to support police during attacks. Germany's post-war constitution, because of the excesses of the Nazi era, only allows the military to be deployed domestically in cases of national emergency. Herrmann has called those regulations obsolete and said that Germans have a "right to safety." Back in January, Bavaria's justice minister launched a state program in Ansbach meant to teach refugees the basics of law in their new host country, amid growing tensions and concerns in Germany about how it would integrate the estimated 1 million-plus migrants it registered crossing into the country last year. Classes include lessons about freedom of opinion, the separation of religion and state and the equality of men and women. "Germany is an attractive country because it respects the dignity of every human being," an educational film shown to newcomers said, "and it is supposed to stay that way."